Spiders that eat other spiders may use sound to avoid cannibalism. (Inside Science) -- The spider world is rife with cannibalism. But eating your own species has drawbacks, from missed mating opportunities to higher risk of disease to accidentally killing your relatives. Such risks would seem especially high for Palpimanus spiders -- specialized hunters that prey on other spiders. Now, a new study suggests Palpimanus spiders may use sound to avoid eating one another. Spiders in this genus have poor eyesight, relying instead on touch and vibration, and they can produce buzzing chirps by rubbing their facial appendages against file-like surfaces on their jaws. 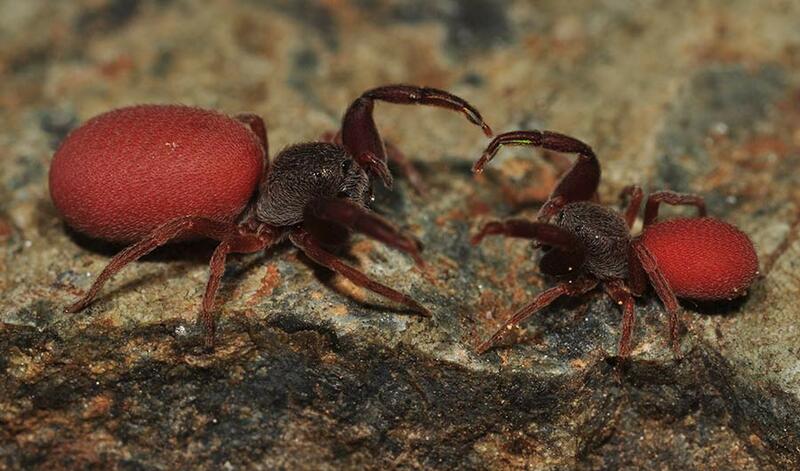 When researchers placed two Palpimanus spiders of the same species together, the spiders typically touched each other with their front legs, then gave a series of chirps. Usually, the spiders separated without harming each other. A few smaller spiders did not chirp, and these ones were frequently cannibalized. Next, the researchers prevented some spiders from chirping by amputating their facial appendages, then placed them with larger spiders. The large spiders were about four and a half times more likely to eat silenced spiders than ones that could still chirp. The findings were published July 10 in the journal Behavioral Ecology and Sociobiology. Loud chirps appear to be a general defense strategy, used whenever the spider is attacked, according to Eva Líznarová and Stano Pekár, two of the study's authors, who are zoologists at Masaryk University in Brno, Czech Republic. In fact, the sound resembles noises made by a type of wasp with a vicious sting, so the spiders may be tricking predators into thinking they attacked a wasp. But soft chirps seem to be for spiders only, used during hunting, courtship and chance encounters, wrote Líznarová and Pekár in an email. Thus, such crooning may help the spiders recognize and avoid eating their own kind.